Benco MFG TT60 – 100 – 150 | VTC MFG Inc.
Benco MFG TT-60, TT-100 and TT-150 are designed to handle a wide variety of small to medium-sized aircraft, including regional jets, business and commuter planes as well as military aircraft. 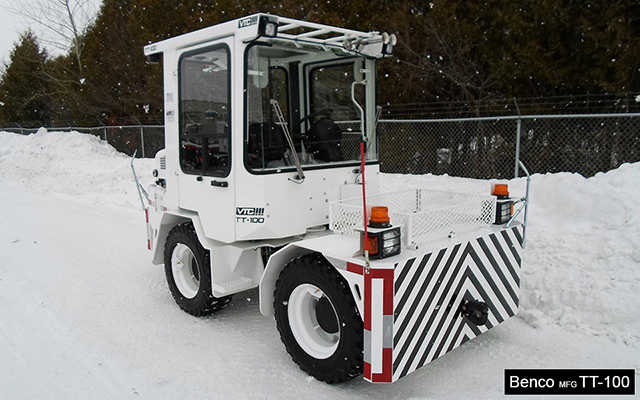 Articulated frame, 4X4 and hydrostatic transmission mean ease of operation and maneuverability on snow, dirt and gravel and provide excellent traction in all weather conditions! 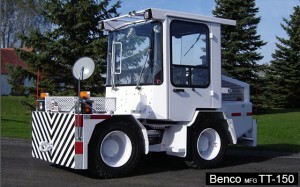 BENCO MFG TT ARE THE MOST MANOEUVERABLE TOW TRACTORS IN THEIR CLASS. Their ergonomic operator compartment features 12” mirrors for tow hitch visibility, allowing operators to handle aircraft efficiently and safely. Numerous cab options available for all types of working environments. Totally enclosed cabin with HVAC. Every TT-series tractor is designed with minimal maintenance.